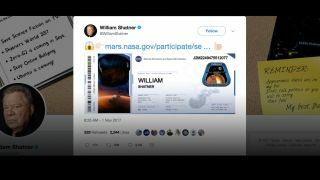 Actor William Shatner recently shared his "boarding pass" for the NASA's Mars InSight mission, which is scheduled to launch in May 2018. Two microchips bearing more than 2.4 million names (including Shatner's) will be affixed to InSight. William Shatner is boldly going to Mars. Well, his name is, anyway. The actor, who famously portrayed Capt. James T. Kirk in the original "Star Trek" TV series and a number of movies, is one of more than 2.4 million people who have signed up to send their names to Mars aboard NASA's InSight lander. The other chip will hold the names of more than 1.6 million people, who signed up during a second call this year. "Space enthusiasts who signed up this last round shared their downloadable 'boarding passes' on social media, complete with the total number of flight miles they've collected by participating in engagement initiatives for other Mars missions," NASA officials wrote in a statement Friday (Nov. 3). A spacecraft specialist in a clean room at Lockheed Martin Space Systems in Denver, where the InSight lander is being tested, affixes a dime-size chip onto the lander deck in November 2015. A second microchip will be added in 2018. Shatner was one such sharer. He posted an image of his "boarding pass" on Twitter, showing an accumulated total of more than 301 million miles (484 million kilometers). If all goes according to plan, InSight — whose name is short for "Interior exploration using Seismic Investigations, Geodesy and Heat Transport" — will land on Mars in November 2018, then begin studying the Red Planet's interior using two main science instruments. One is a heat probe that will hammer itself up to 16 feet (5.5 meters) underground; the other is a suite of three seismometers known as the Seismic Experiment for Interior Structure (SEIS). Favorable alignments of Earth and Mars for planetary missions occur just once every 26 months, so InSight's launch was pushed to May 2018. The lander's observations should reveal a great deal about Mars' internal composition and structure —information that should, in turn, shed light on the formation of rocky planets in general, NASA officials have said.